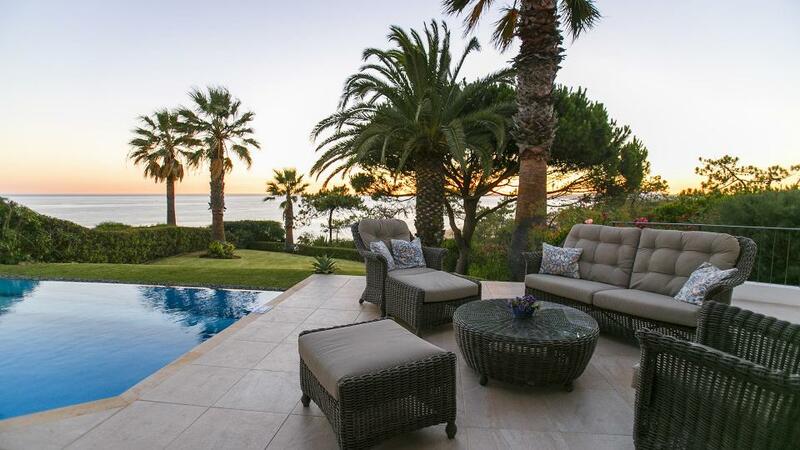 Villa Swing is a linked villa in Vale do Lobo with an enviable position benefiting from breathtaking views, overlooking the Royal golf course and the Atlantic Ocean. The villa is walking distance of the famous "Praça" with a choice of restaurants and bars. This is the perfect place for family or friends holidays. Room, Ground level. This bedroom has 2 twin beds configurable as a double bed. Bathroom ensuite, With shower. Room, Ground level. This bedroom has 2 twin beds configurable as a double bed. Bathroom ensuite, With bathtub. Master bedroom, 1st floor, view of the sea. Bathroom ensuite, With 2 washbasins, bathtub, shower. This bedroom includes also private terrace. Villa Swing will charm you with its traditional decoration. You'll find the fully equipped kitchen decorated in marble and natural wood, a living/dining room, and a cloakroom. The dining area has a rectangular table for six persons and shares its space with the living area which has two sofas and a TV with free view UK channels, a DVD player and a CD player. From the living room, patio doors take you to the pool terrace where the private swimming pool is located, measuring approximately 6 m x 3 m, pool heating is available upon request. Also on this terrace there is a built in charcoal barbecue and a table for al fresco meals, perfect to enjoy the sun.